A short account of events on the Eastern Front during the Russian Civil War. The Right Socialist Revolutionaries were always strong in the Volga region of Russia. They began to form links with the Czechoslovak Legion. The Bolsheviks had assumed that these units would, at Trotsky’s command, act to attack the Germans on Russian soil as part of an Allied offensive. However soon Trotsky had to realise that the presence of Allied forces on Russian soil violated the Brest Litovsk peace treaty and that they had to be disarmed. The Czechs refused this, fearing internment and worse, and began marching eastwards, fighting where necessary. Shortly after the Anarchist-Maximalist uprising at Samara and its crushing by the Bolsheviks, the city was captured in a joint Right SR-Czechoslovak operation. The Right SRS had been excluded from the Soviets on 14th June 1918. This ban had not applied to the Left SRS who still had considerable influence in the Soviets. They hoped to overturn the Bolshevik majority there through democratic means at the Fifth Congress of Soviets. However, the Bolsheviks changed the electoral rules so that representation came not only from peasant soviets where the Left SRS were strong, but from Poor Peasant Committees set up by the Bolsheviks to enable the grain requisitioning. The vote was gerrymandered and the Left SRS were severely antagonised. Tensions began to rise between the two parties. Trotsky, who referred to the Left SRS, a party with impeccable revolutionary credentials, as “rogues” and “criminal adventurers”, denounced them at the Congress on July 6th .This infuriated the Left SRS and they rose in insurrection in Moscow, This was put down mainly thanks to the Latvian Rifle Regiment led by Joachim Vacietis (Vatsetis). On the Volga front the Red Army was commanded by Colonel Mikhael Muraviev, who had been put into place by Trotsky. He had served in the Tsarist Army and was a member of the Left SRs. His considerable military skills had saved the situation on the Volga front and recovered lost ground. Muraviev, following the Moscow insurrection, announced that he had resigned from the Left SRs. However, he now rose in revolt, and read out the Moscow declaration of the Left SRS to the soldiers, announcing an attack on the Germans and giving himself the self-description of a Garibaldi who would lead a People’s Army to drive out the occupiers. He lied to the soldiers by omitting to tell them that the insurrection in Moscow had already been put down. He urged the Czechoslovaks to join in an attack on the Germans. The Bolsheviks lured him to a meeting where he was killed. A story was put out that he had committed suicide, but the evidence of five bullet holes and several bayonet wounds somewhat contradicted this! With his death the revolt was broken but the Red Army still had to contend with the joint Right SR-Czechoslovak threat. Vacietis was sent to the eastern front to sort out the situation and accused Trotsky and Chief of Staff Bonch- Bruevich of having reduced the Army to utter defencelessness. Near the mouth of the Kama 300 Red Army troops with two field guns and several machine guns under the command of Trofimovsky were forced to retreat seizing the steamer Missouri and other ships and going down the Volga to Cheboksary. Kazan fell to the Czechoslovaks on August 5th. Trofimovsky has been described in different sources as either an Anarchist or a Maximalist. The Bolshevik A. I. Selyavkin in his memoirs described him as bearded and wearing a Circassian coat with a silver mounted sword and dagger, fulfilling the usual image of the swashbuckling partisan leader. Trotsky sent out a telegram to have Trofimovsky arrested. Trofimovsky had done no more than the Bolshevik leader Kuibyshev. He had always been held up as the model Bolshevik, never retreating and Samara was given his name for a period. New evidence has revealed that Kuibyshev with other Bolshevik leaders took a steamer on the Volga and fled to Simbirsk in this period. He was not punished for this. The pretext for the attack on Trofimovsky was indeed that he had retreated from the enemy and Trotsky had insisted that this would be met with severe punishment in any circumstance. Obviously this was arbitrary. It seems more likely that Trofimovsky was targeted because of his political opinions. Red Army leaders who were seen to be of an independent mind, whether or not they were Bolsheviks, had to be curbed in the interests of the drive for centralisation as started by Trotsky. In addition Trofimovsky had been a friend of Muraviev and was thus suspect. It appears Trofimovsky had some ex-Tsarist officers and wealthy landowners shot in the village of Sidelnikov. This was one of the charges brought against him at his trial. On 5th/6th August several destroyers arrived and Red Army forces surrounded the Trofimovsky detachment. Trofimovsky was arrested. In tears, he remonstrated that he had always served the Red Army faithfully. He was taken to Nizhny–Novgorod where he was tried and shot. The local Bolshevik press waged a war of slander against him after his death, calling him a “sadist”, “drug addict” and “drunk”. “I issue this warning: if any unit retreats without orders, the first to be shot will be the commissar, and the next the commander”. Future events were to show that this was not an idle threat. “Yesterday twenty deserters were shot… The first to go were commanders and commissars who had abandoned the positions entrusted to them. Next,cowardly liars who played sick. Finally some deserters from among the Red Army men who refused to expiate their crime by taking part in the subsequent struggle”. Trotsky had stepped over the line with this action. He was now shooting soldiers who were members of the Bolshevik Party. Panteleev had been a long-serving member, whilst Trotsky was a member for barely over a year (he had joined the Bolsheviks on 2nd July 1917). Trotsky was waging a war against the commissars in the Army, backing the ex-Tsarist military experts and officers (spetsy). 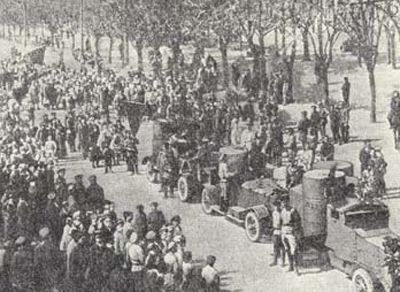 A wave of agitation against Trotsky within the Red Army started almost immediately. Surely, it was argued, these officers were far more suspect than Party members. Lenin backed Trotsky against this agitation. Later on Trotsky was to fulminate against the views of the opposition saying that this was a “plebeian protest at the ‘wooing’ of military specialists” and was merely an “instinctive hatred towards a stratum which used formerly to occupy a leading position in society”! For his part Lenin urged on Trotsky to carry out more repressive measures. On the 30th August he telegrammed Trotsky to tell him to shoot Vacietis and other commanders, as had been done during the French Revolution, he noted, if they failed in recapturing Kazan. The shooting of Panteleev and Gneushev was to initiate a series of shootings. By the end of 1921 hundreds of commanders, commissars and soldiers had been tried and executed by military tribunals. The shooting of Panteleev was to come back to haunt Trotsky. A Military Opposition was formed within the Bolshevik Party in March 1919. It consisted of many ex-Left Communists like Smirnov, whose criticisms of the spetsy were those above as well as people like Stalin and Voroshilov who had a visceral hatred of the old Tsarist officers. The Panteleev case was raised again. And when it came to the decisive struggle between Stalin and Trotsky within the Party, many Old Bolsheviks remembered the Panteleev case and came to the opinion that there was more evidence for Trotsky being an incipient Bonaparte than there was for Stalin.